Actually, both of those are not entirely deserved, nor totally fair, but read on for the full tear-down. The nightlight in question is a cheap made-in-China LED model with a light sensor which turns off the nightlight during the day. The idea is to save you electricity, and this is why we buy them, thinking “I’m going green! Not only do I have low-power LEDs, it’s only on when the room is dark!”. This is the “American consumers are suckers” part because light is indeed only on when it’s dark, but still consumes about the same amount of power. Electrically, it’s a ridiculous design. It uses three extra parts (and corresponding extra circuit layout and more complex case design) to consume the same amount of electricity regardless of whether or not it’s lit. That’s the social engineering part and the American Consumers Are Suckers part – the device appears to behave just as we expect it to but in reality does nothing of the kind. Furthermore, most of us have no way of knowing so the designers can get away with it. 1 The neon nightlight, for reference, consumes about 3.4mA but is mostly useless for illumination of anything beyond about six inches. 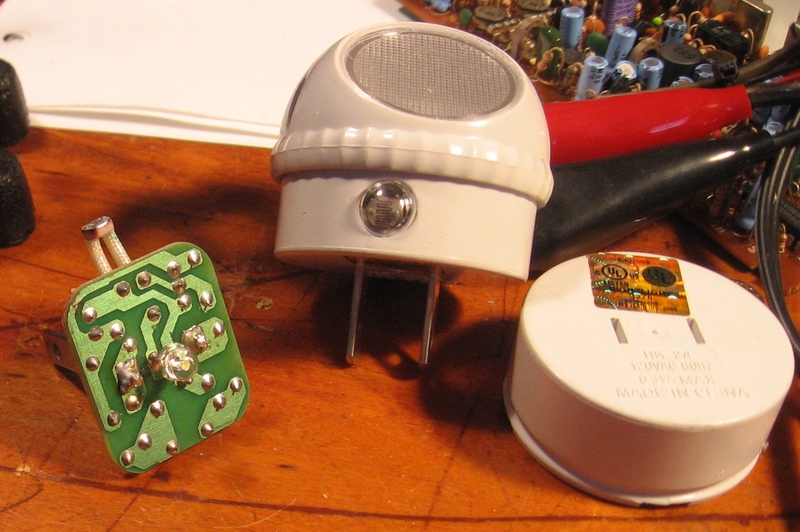 A standard 4W incandescent nightlight uses about 33mA. I have not converted current measurements to power because I suspect the LED lights have a comparatively low power factor and I don’t have a good way to measure or calculate. 2 Rated maximum power consumption of 0.3 W*24 Hours*365 days=2628 W-Hours per year, or 2.628 KW-hours, each of which costs about $0.15 according to the CMP Home Energy Calculator, accessed 2012apr28 – rates at the bottom of the page. This entry was posted in Projects, Scribbles & Jots and tagged Commentary, Hacks by The One True Stickman. Bookmark the permalink.